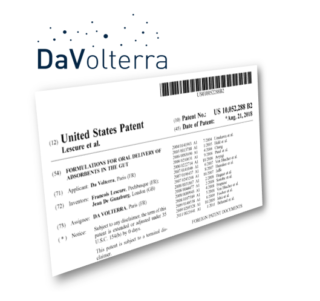 The US Patent and Trademark Office has recently granted a new patent for Da Volterra in the USA. The patent was issued under number 10,052,288 and relates to DAV132, our phase 2 asset to protect the intestinal microbiota from antibiotic-induced disruption. This new patent reinforces our intellectual property portfolio and comes as a complement to the already 100+ patents protecting our products worldwide.